My first visit to Hemel Hempstead was short and sweet, my twin sister and I were born in Marnham Ward, West Herts Hospital, and went home to Chesham shortly afterwards, and later spent the war and adolescent years in Northern Ireland. 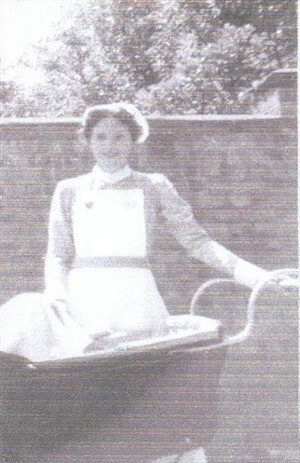 I returned to London in 1953 to commence nurse training, and met my future husband during the autumn of that year. He was doing his National Service with the RAF, and I learned he came from Hemel Hempstead. Lionel spent his National Service in Egypt and I got on with nursing and in 1956, to save money on stamps and notepaper, we married and I returned to the town of my birth. Our first home was a shared cottage in Piccotts End, and I started work at St Pauls Hospital, off Queensway (now demolished). The buildings at St Pauls were very old even in 1956, prefabricated huts, with a covered walkway. Each hut was a ward of approximately 28 beds and I remember there were at least five of these huts. On another part of the site stood a large Victorian building, which was the maternity unit. I became Staff Nurse on Marie Curie Ward, a female medical ward. Twenty-eight beds were laid out, fourteen each side of the building, and two coke stoves either end provided heating. I soon became aware of alienation in St Pauls, with an Irish accent as thick as a pint of Guinness I was always referred to as “that London Nurse” by patients and staff alike. So I moved on, did some private nursing and was approached one day by Miss Featherstone, Head of Domiciliary Nursing Services in Hemel Hempstead, and offered a job as a District Nurse and so became a roadrunner. My mode of transport was a bicycle with a rack over the rear wheel and a basket on the front. I was supplied with a metal suitcase covered in blue canvas which contained instruments and a box with lint rolls and large gauge rolls. Each night I had to sterilize the instruments, cut and fold dressings and sterilize them in a biscuit tin in the oven and repack the case for the next day. 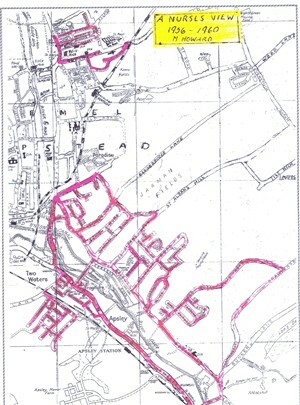 The area I covered was from the High Street to Red Lion Bridge on the London Road, and covered the Manor Estate, also Belswains Lane and St Albans Road, and all the houses on and in between these roads. A large area but even though busy it was a happy time for me. I was not placed near the New Town areas so I dealt with old Hemel. Miss Parkin in Herbert Street lived in a large Victorian house in the old town. She was very elderly and lived with her brother. On their shopping day they rode out in style in an open-topped Bentley and were well known to the locals. I was always given an apple for my husband when I called as she remembered him in infant’s school. On cold days a hot cup of marmite, one tablespoon in a cup of water, was provided and I had to drink it. Apsley now being developed has changed little from 1957. The Manor Estate is still there behind London Road. My bike I used to park outside the doctor’s surgery and walk to the patients on the Manor Estate. These houses were more modern and had hot running water and bathrooms and central heating, which was a bonus. Coming down from the Manor Estate I’d visit my patients in Orchard Street and Weymouth Street. These were terraced cottages and in the main had outside toilets and no hot running water or bathrooms. Cissy in Weymouth Street used to sit outside in the fine weather and chat to her neighbours and people passing by. She regularly ‘lost’ her surgical boots, we’d supply new ones as well as rolls of gauge which she always asked for until I noticed she had gauge curtains – a change from net ones I suppose. I wasn’t allowed to leave until I had a cup of tea, very sweet and very hot (and I didn’t take sugar). Belswains Lane is unchanged and Hobbs Hill and Oliver Road remain the same. I had a dear old gentleman in Oliver Road. He was looked after by his daughter and it took a lot of persuasion by his daughter to let me in to treat him. He was set in his ways so a ritual was performed each time he had to have his treatment and expletives by the score heaped on me. A cup of tea and chocolate biscuits renewed a cordial relationship. Crabtree Lane and Seaton Road were busy areas. There were prefabs at the top of these roads, and of course were ‘modern’ in relation to the other areas I covered. Younger residents lived in these houses and expectations of what the NHS should do were higher. I still recall being called to a house and having to carry out an enema and left under a hail of abuse as the NHS hadn’t provided a toilet roll. No hot drink there! Our HQ was Churchills, a large Victorian house just off St Johns Road where the Sports Centre now stands. Baby clinics were held there and other clinics as well. Also coupons for MOF orange juice could be redeemed. The NHS was still very new and people’s expectations were less than today’s patients. Having free treatment was alien and appreciation was shown with cups of tea, jars of jam, fresh vegetables, fresh fruit and home-baked buns. The majority of the homes I visited had outside toilets, no central heating, no hot running water. 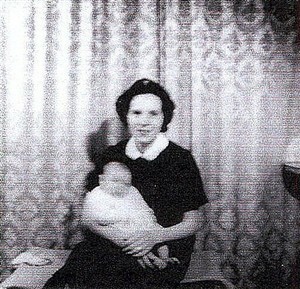 The majority of babies were born at home as the maternity unit at St Pauls was small. The midwives had a pupil midwife from the hospital to help them and to learn about midwifery on the district and delivering babies at home. 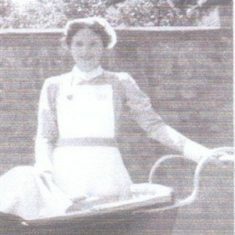 Midwives were supplied with Morris Minor cars and also some of the District Nurses; I stayed with my trusty bike. 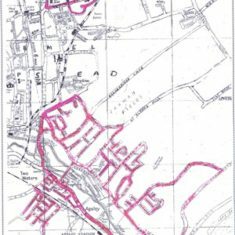 It was relatively easy to get around Hemel Hempstead, there were no traffic lights, roundabouts and no dual carriageways, only the hills were a pain when pushing a bike up them. If Hemel Hempstead had patients with character so did the doctors. One had been an army captain and used soldier’s vocabulary on his patients. Another rode around in a land rover and hummed and droned out of tune when suturing. Everybody was ‘Poppet’ when another called. Sick rooms were dusted, washed and polished and so were the patients in preparation for the doctors visits. Admission to hospital was a cause for concern and St Pauls, known to the locals as the base, had the reputation that no patients went home – totally untrue. Bennett’s End Hospital on St Albans Hill had been an isolation hospital but had become a low dependency unit for mental health patients. I cannot recall any residential homes in the area for the elderly, but there was a nursing home in Berkhamsted (private). Convalescent homes were the norm for the rehabilitation of patients discharged from hospital needing a break between hospital and home. Woburn Sands had such a home and was regularly sent patients from West Herts. The chemist’s shops in Hemel were independently owned and run by the pharmacists: John Bryon’s was one side of St Johns Road in Boxmoor and on the opposite side was Shields and Warren. In the High Street, Marriott’s was opposite the old market square and further down the street was Robinson’s, and Boots on the corner of George Street. Mr Taylor had a shop in Bridge Street, and on the London Road was Figgs. These were the chemists I visited most on my patch. 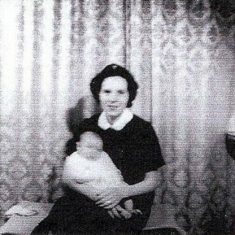 In 1960 I left the District Nursing Service to have a baby. By then my husband and I were living in Boxmoor and were starting a new generation of Howards in Hemel.